Janie Bress - My North Shore Blog: Discover Chicago's North Shore This Weekend! Discover Chicago's North Shore This Weekend! Spring is a beautiful time of year along Chicago’s North Shore. Budding trees, warm breezes and vibrant colors have brought a fresh sense of excitement to cities such as Winnetka, Northbrook, Glencoe, Highland Park and Deerfield. If you live in one of these great communities you’re probably already finding ways to get out and enjoy the latest season. For those of you who haven’t yet settled into Chicago’s North Shore, but are considering buying a North Shore home this spring; you may be planning a trip to discover what the North Shore has to offer. As a North Shore Real Estate agent for a number of years, I can attest that spring is one of the best times to buy a North Shore home. Given the current buyers market, as well as low mortgage rates and home prices; now is an ideal time to begin searching for a home in the North Shore. If you’re planning on visiting the North Shore this weekend to get a better feel for this north of Chicago area, or you’re a North Shore resident and looking for something to do this weekend; I’ve listed a few events you may want to check out! - If you have a green thumb or just want to learn more about caring for your lawn and garden, don’t miss the Lawn & Landscape Summit at the beautiful Chicago Botanic Garden this Saturday. You’ll learn eco-friendly and natural methods for lawn and landscape care, as well as being able to hear from landscape experts during question and answer sessions. A naturally healthy lawn will be the theme of this event which is co-presented by Calcium Products and the Lawn to Lake program. Purchase tickets and learn more at the Lawn & Landscape Summit website. 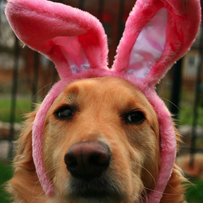 - The Doggy Egg Hunt is a great way to meet other dog owners and pups in the North Shore! Winnetka’s Park District is hosting this even for the first time this coming Saturday and will be great fun for pooches and people alike! Plastic eggs filled with dog treats will be hidden all over Centennial Park for canines to find. Dogs participating will receive a “doggy bag” to commemorate this fun filled morning. The under 30 lb part will begin at 9am and the over 30 lb at 10am. The cost for this event is $5 for current Centennial Dog Beach passholders and $10 for non passholders. For more information contact the Winnetka Park District at 847-501-2040. Both of these fun events are worth taking part in and will be sure to give you insight into the North Shore culture and community! I always enjoy pointing out events taking place in the North Shore since buying a home is much more than the home itself; it’s also about the lifestyle of the area in which you live. If you have any questions about North Shore living or are ready to take the next towards buying a home in the North Shore; please contact me! I would enjoy helping you discover the North Shore and find the home that fits your needs and lifestyle perfectly.